first lines are from the Jan 1895 article, next are my research. Mr and Mrs. W.S. Cottington, natives of Alabama, had been members of 2nd Baptist of Atlanta, converted to Universalism after hearing Rev Q. H. Shinn. William S. Cottingham (1850-1903) born in Talbotton, Georgia, moved to Atlanta in the 1880s. A dairyman and farmer in Atlanta (he had some of the first Jersey cows in the Atlanta area), he became a traveling salesman in the early 1900s. Narcissa Cottingham (1853-c1909) Born in Alabama, married in 1873, Her daughter Mary was a school teacher, with years of piano training. Daughter Elizabeth married William "Park" Felker in 1906. Rev Ellenwood of the Universalist Church officiating. Mr and Mrs. Alexander Beck, were also former members of 2nd Baptist, they converted by reading Universalist literature sent by the post office mission. Alexander Beck (1849 - 1908), moved to Atlanta in the 1870s, he apparently liked to say that his occupation was "traveler", which indeed he was. Very frequent traveler. Five months before his death, he took his son, Henry. to Denver Colorado, where they hoped they could recover his health. In business there he was successful, but not in health. The funeral was in the Universalist Church, of which he was called a "loyal and consistent member." Funeral led by Rev Ellenwood. Cora Beck (1851-1938), daughter of Rev Warren, who was pastor of the First Baptist Church in Atlanta. She had ten children, of which four of the first five died in infancy. She was president of the local Universalist Woman's Mission Circle in 1908 and 1910. She was elected to the board of the Georgia Universalist Convention in October 1908. President of the Industrial Arts League in 1911. Henry O. Beck (1888-1911), son of the above, in bad health for awhile, was a member of the church for "several years" prior to he death. From Joillet Illinois, Mrs. H.A. Harwood, Bertha Harwood,Mrs. A. L. Blackman, Spencer. They was an active Universalist Church in Joilet. Helen A. Harwood (1830-1914) moved to Atlanta in the mid-late 1880s, with her daughters after the death of her husband. Active in the social scene of Atlanta. Alma L. Blackman (1855-1932) widow when she moved to Atlanta with her mother and sister and son. Became an art teacher, advertised frequently. Bertha H. Harwood (1866-1949)Born in Illinois. Extremely active in the Atlanta social scene - was President and co-founder of the Atlanta Musical Association, 1908-1911, created to encourage opera in Atlanta, and show surport ot the idea of performances on Sunday. Active in the Daughters of the American Revolution.. Married an Arrowood in 1912 -believed by some to be Milton Arrowood. They did leave Atlanta right about this time. It also looks plausible that they were divorced in Florida in 1941. We do know that some of her music related notes. files, and correspondence are in an archives in Atlanta. Spencer E, Blackman (c1884-1906) died of typhoid fever. He had been living since c1900 in Jacksonville, Florida, and had worked for the fire department. update 14 Nov 2010: Bertha Harwood did indeed marry Milton "Wallace" Arrowood (1983-). The marriage was performed by Rev Ellenwood of the Universalist Church in 1912. They left Atlanta for Florida and then Wilmette, Illinois, sometime around 1915. One child. They separated circa 1927, while living in Greenwich, Connecticut. He was infamous for being the first Annapolis graduate to desert from the U.S. Navy (in 1905), after his request for resignation was rejected. He deserted because he had discovered that the Navy allowed non-Christian sailors on board their ships. I mention this mainly because of the connection with Universalists in 1912. She was 15 years older than he, and had shaved off 23 years off her age by the 1920s, thus making positive identification more difficult. Unless noted, we only know these folks were Universalist in circa December 1895. Members of both the 1880s congregation and the new one. converted by Rev. D.B.Clayton (then of Atlanta). He was a former Methodist and she a former Methodist. Children were James, Howard, and Mrs. Cullpeper. he joined the Rebel army in 1862 at age 19, just days before the Battle of Shiloh. At some point he was captured and was held at the Lousiville (KY) Military Prison until being released in September 1864. In 1870, he and his younger brother ran a store in Marietta Georgia, which he continued on his own to at least 1880. He continued in the mercantile businesses in Atlanta, including the Atlanta Fire and Waterproof Paint Company. He was active until the summer of 1919, visiting his daughter in the Panama Carnal Zone. He died three months later at the Confederate Soldier Home in Atlanta. He was also a member of the Odd Fellows. Louisa McCutcheon (1844- ) born in Cherokee, Georgia. Upon the death of H.D. she moved in with her daughter in the Canal zone. She apparently died in the middle 1920s. Emma L. McCutcheon Cullpepper (1873- ) married G. W. Cullpeper in 1892. She filed for divorce in 1906, due to his habitual drunkenness and having assaulted her. He died in 1909. She lived with her sister in Atlanta, after the death of her sister's husband. She is in the 1930 census. James B. McCutcheon (1876- )worked at the Post Office in the 1890s, but spent most of his career selling farm instruments. Moved to Alabama in the 1920s. Howard Clayton McCutcheon (1878 - 1956), Officer of the Georgia Universalist Young People's organization in 1897. 1911 recited at the Universalist Christmas pageant (with niece Catherine Garwood). Managed and then owned a print shop. We will assume that his middle name was in honor of Rev. Clayton. H. D. was active as secretary of the Georgia Universalist Convention in the 1880s-1890s. In the 1890s, he was listed as living in "Pleasant Valley". An Universalist Church existed in "Pleasant Valley" from 1874 (building in 1875) for the next 10-15 years. I'm not exactly sure where this particular "Pleasant Valley" was. "Mr and Mrs. H. Linch were Georgia natives," and also members of the 1880s church. to affiliation with the Universalist denomination. His mother was Mahalia Prater. He had a brother named Giles Chapman Linch, after the (small u) universalist minister before their grandfather. He was born near Prosperity, and his family moved to Columbia, SC and then Madison, Florida before the war. After the war, he moved to Atlanta, and established a junk selling business, which replaced in the 1880s, by a Hide and Tallow business that was very successful, usually having around 6-10 full time employees. Permelia "Gabriella" Hicks Linch (1853-1932) - Born in Georgia, and married when she was 16. After the death of her husband, she lived with one of her two daughters, moving with them to Louisville, Kentucky in the 1920s. Born in New Hampshire, lived in Massachusetts before moving to Atlanta. Probably Mary F. Day,(1813- ) the only Day I could find in Atlanta in 1900, from New Hampshire, and then had lived in Massachusetts. Her husband, David, had been a grocer in Atlanta in 1870. She was a widow, living with her daughter's family in Atlanta in 1900.
update 14 Nov 2010: I should have mentioned that H. Linch was active in the Georgia Universalist Convention in the 1880s. This is another one of Google's street views - this time of downtown Canon. The Church was founded in 1885, and was the home church of Rev. J. M. Bowers, editor / publisher of the Universalist Herald, and traveling Universalist minister / missionary. Current Services the third Sunday of the month at 11 AM. The first Universalist Church in southwest Georgia, and about 50 miles from the nearest other Universalist Church (in Florida). 1920s monthly services, attended by other church's membership - as Pine Park was a circuit route for other denominations as well. 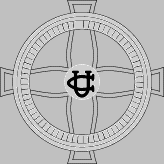 1943/1944 Rev. Roger D. Bosworth of the Atlanta Church was temporary providing services. in the 1990s, it was apparently the Pine Park Community Center. by 2002, vandals had knocked the doors in. In 2006, the building was acquired by Baptist college of Florida in Graceville, Florida. May 2006 Building was restored and in their Heritage Circle, now being used for teaching Southern Baptist ministers. former location: 6 miles west of Cario on US 84. On left, Just before the convenience store. A monument for the church was placed there in 2006.